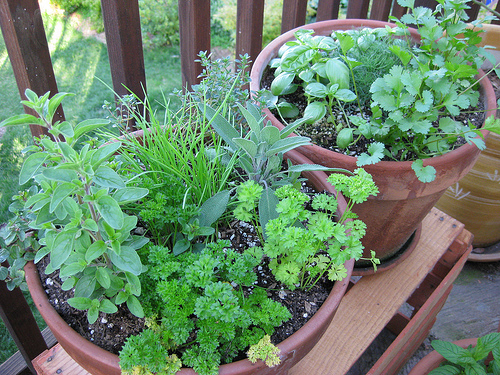 Here are some additional tips you should use if you want to grow your own herbs. Herb gardening is usually not difficult, but it’s always useful to know a few tricks. Make your herbs thrive so you can have a great harvest. You should also know how to use your herbs in the kitchen to make numerous tasty dishes. Make sure that you plant your herbs in a quality soil. It should be fast-draining and you should add some compost into the garden beds before you plant your annual herbs. If you wish to grow herbs in containers, use quality potting soil. Your newly planted perennial herbs need a lot of water. You should give them water regularly. Once they are established they typically can tolerate some drought, but not to the extreme. Annual herbs, on the other hand, need regular watering all throughout the growing season. Mint is a herb that prefers slightly moist soil, so you should pay attention to that. Most herbs will benefit from occasional supplemental feedings during the growing season. You may use an organic granular fertilizer for this purpose. If you wish to grow “Kieffer” lime, it’s best to use a plant food specially made for citrus trees. To get the most of the harvest, it’s important to snip fresh herbs as it develops new growth. Always take as much as you need at the moment. If you wish to grow lemongrass, cut of the thick, bulbous stems just above the crown on the ground level. Peel off outer sheath and use the bottom third of the plant for your dishes. Herbs are great in salads and soups, but this isn’t the only way you can use them. Be creative and try many different ways to use herbs in your meals. Add herbs to your sandwich. Use dill, tarragon and chervil to add a special taste to your mayonnaise. Add some minced red onion and celery to it. Stir this mixture into chopped roasted chicken and serve on bread or toasted croissants for a great sandwich. Use mint in your cocktails. To make a refreshing cocktail, mash some mint leaves with lime juice, minced ginger, rum and ice. Shake it well and strain into a cooler glass. Top the cocktail with ginger beer. Use “Kieffer” lime leaf to make a great soup. Mix it with lemon basil and add it to chicken and rice soup to add a special flavor to them. You may also sprinkle your soup with some sliced chiles and fresh cilantro leaves to make a Thai version of a classic soup. Use some chopped sage to make a special side dish. Fold the sage and blue cheese into mashed potatoes. Sprinkle it with some chopped toasted hazelnuts. Use herbs for your main dish. You can top a snapper or black cod with salsa verde, cilantro and epazote leaves. Or you may wrap a seasoned fish in an Hoja santa leaf and rub the outside of it with oil. You should grill the fish until it feels firm. Serve the fish with beans and rice.